Alphonse “Al” Julian, 92 formerly of Bolton, passed away peacefully at his home in Parker, Colorado on Wednesday, January 23, 2019. Al was born and grew up in Fall River, Massachusetts. He was the son of the late Alfonso Juleao and Margaret Julian. Al was happily married to the love of his life, Alice “Dolly” for 67 years. They lived in Hartford and Bolton, Connecticut, before relocating six years ago to Parker, Colorado to be closer to their son and daughter in law. Al leaves his wife Dolly, their son Kevin and his daughter-in-law, Teresa Kent-Julian. Al also leaves his sister-in-law, Shirley Medeiros Mohamed and Joseph Mohamed of Sacramento, California, brother-in-law Tony Medeiros and sister-in-law, Marcie Medeiros of Westerly, RI in addition to other extended family. Al was pre-deceased by his sister Albertine Vincent, sister Ida Da Rosa and his brother Duke Julian. Al served in the Army, as a Sargent and was stationed in Manilla during the Korean conflict. After serving his country, he worked at the Shipyards in Newport Rhode Island before joining his father in the road construction industry. Al began his construction career with the Savin Construction Company, before joining the Enfield Road Construction Company, which in 1967 became the Della Construction Company. During his career he oversaw multiple projects including those involving, Interstate 91, Interstate 84, Logan Airport and Bradley Field Airport. Al decided after many years at Della, that he would partner with a longtime friend John DaSilva, to open their own company, Jonal Construction. He retired from Jonal Construction to spend time with his wife Dolly. He was instrumental in sponsoring family and non-family members in the immigration process from Portugal to the United States. Al was known for his sense of humor, charm and generosity to family and friends. He could always be counted on to assist someone in need and enjoyed working on projects around his home. Known for his wit, charm and generosity to his family and friends. He could always be counted on to lend a hand to someone in need. Pranks and practical jokes were a part of Al’s sense of humor. Many of those took place with his brother in laws (who were like his brother), Tony, George and Joe. He was a parishioner of St. Maurice Church in Bolton, and during that time was an active member of the Parish Men’s club for many years.A sincere thank you to Fil and Lerma who have lived with Al and Dolly for the past several years and cared for them, along with Debbie, Heather and Lisa. You will always be a part of our family. Calling hours for Al will be held on Friday, February 1, 2019, from 4-7 p.m. at Holmes-Watkins Funeral Home, 400 Main St., Manchester. A Mass of Christian Burial will be celebrated on Saturday, February 2, 2019 at 10 a.m. at St. Maurice Church, 32 Hebron Rd, Bolton. Guests are asked to please go directly to church. Burial with military honors will follow in St. James Cemetery, Manchester. Memorial donations in Al’s name may be made to the Bolton Volunteer Fire Dept, 168 Bolton Center Rd, Bolton, CT 06043. 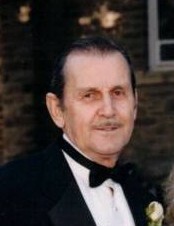 To leave an online message of condolence for his family, please visit www.holmeswatkins.com.